It is tears and mourning for the family members of Michael Maji a.k.a Mike SARS who was brutally murdered 10 days after getting married. 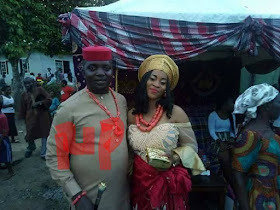 The SARS officer identified as Michael Maji a.k.a Mike SARS was killed by assailants in his in-laws community, the same place where he did his traditional wedding. "It saddened my heart since the day I saw your obituary on the platform of a very beautiful, charming and lovely sister Thonia RealAngel on Facebook while on transit, announcing your untimely death Mike. Just ten days after your Marriage ceremony in Khana, Rivers State. I didn’t believe it until you were laid to rest finally in your home town. Eighteen years back we started this journey together to curtail the criminality that disturbs our dear great Nation Nigeria; promising to bring down crime to the lowest level, in the period of our service. The love for security makes us to respectively took the footsteps of our beloved Dads in a different outfit, The Nigeria Police Force, with the spirit of fighting crime with the whole of our heart and strength being barrack boys, as copied from them. Our diligence, agility, transparency, honesty and intelligence mindset makes people to hate us, as we’re into “doing good to good people and doing bad to bad people”. But we keep struggling in making them mute. Now your enemies have succeeded in killing you, at the same area you wedded. Oh! What a wicked world? Sacrificing our today for the betterment of tomorrow Nigeria will never seize bro. Consequently your death still keeps me entangled Michael Maji. The painful side of it all is separating you from your love ones, especially the young widow with your unborn child. I pray God Almighty to give your family the fortitude to bear the irreplaceable lost. To you whom thinks you’ve succeeded, you and your entire household will never see peace in your life by the grace of God Almighty, until you repent. Rest in Perfect Peace soldier!"